Not to be confused with Springwood, New South Wales. Springwood is a suburb of Logan City, Queensland, Australia. The size of Springwood is approximately 6 km². It has 17 parks covering nearly 9% of the total area. The population of Springwood in 1996 was 9,738 people. By 2001 the population was 9,084 showing a population decline of 7% in the area during that time. A high proportion of people in Springwood are in the baby boomers generation compared to population proportions in the surrounding local government area. Springwood is a significant activity centre in the region, with a major bus station, two hotels, a 24-hour McDonald's, two state primary schools, a state high school, a campus of Calvary Christian College, a public library, three shopping malls, ambulance, fire and police stations and many places of worship (including Church of Christ, Uniting and Seventh-day Adventist churches). 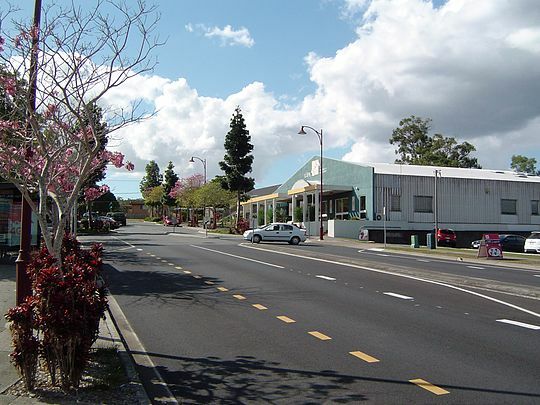 Most commercial activity in Springwood is centred on the "town centre" in the north-west of the suburb along the Pacific Motorway. An increasing amount of commercial development is also occurring in the south-eastern parts of Springwood, an area unofficially known as Chatswood Hills. The remainder of the suburb is primarily middle-class residential areas. Before colonisation, Indigenous Australian people from the Yugambeh and Jaggera language groups inhabited the local area. Springwood was laid out as a development when the South East Freeway to Brisbane was planned, at one end of the proposed Freeway. This was expected to be finished in 1972, but was not finished until 1985. The development was named after the pineapple plantation of Brigader Sam Langford, slightly north of town. Until September 2006, Springwood was home to an IKEA store, before moving to a new location in Slacks Creek, directly across the Pacific Motorway from Chatswood Hills. In the 2011 census, Springwood recorded a population of 8,990 people, 50.5% female and 49.5% male. The median age of the Springwood population was 37 years, the same as the national median. 66.8% of people living in Springwood were born in Australia. The other top responses for country of birth were New Zealand 8.8%, England 4.7%, South Africa 1.1%, Scotland 0.9%, Philippines 0.9%. 85.2% of people spoke only English at home; the next most common languages were 0.9% Cantonese, 0.6% Mandarin, 0.6% Thai, 0.5% German, 0.5% Korean. In the 2016 Census, there were 9,148 people in Springwood. Of these 49.1% were male and 50.9% were female. Aboriginal and/or Torres Strait Islander people made up 1.6% of the population. The median age remained unchanged at 37 years. 63.5% of people were born in Australia. The most common countries of birth were New Zealand 8.4%, England 4.1%, India 1.6%, China (excludes SARs and Taiwan) 1.2% and Philippines 1.0%. In Springwood, 79.4% of people only spoke English at home. Other languages spoken at home included Mandarin 1.4%, Korean 1.0%, Cantonese 0.9%, Romanian 0.6% and Punjabi 0.6%. From the 2000s both the Queensland government and Logan City Council have proposed that Springwood should be redeveloped as a Principal Activity Centre (PAC). This was initially noted by the Queensland government in a 2005 paper, South East Queensland Regional Plan. The paper, in addition to its follow-up paper in 2009, cites multiple reasons for developing a PAC in Springwood: the area's close proximity to the Pacific Motorway, its strategic location between Brisbane City and the Gold Coast, existing urban infrastructure and availability of affordable housing. The aim of the proposal is to reduce growth pressures in established PACs whilst encouraging more employment opportunities and economic growth in South East Queensland. In October 2009 Logan City Council partnered with GHD to create a master plan for redeveloping Springwood as a PAC. This plan was made after consultations with key stakeholders and residents in the local area. Using the South East Queensland Regional Plan as a foundation, the master plan envisions a future for Springwood in the year 2031 and beyond. The plan proposes a significant change in form and function of the suburb compared to its current state. As a suburb with a significant presence in automotive retail showrooms, the plan encourages these showrooms to consolidate around Compton Road and the Logan Mega Centre. The plan proposes new low-rise office spaces, residential apartments, recreational spaces, retail and commercial spaces to be developed within close distance to Springwood Bus Station. Moreover, the plan outlines two new town squares, a new road intersecting Dennis Road and Carol Avenue, a theatre, an art gallery, rehabilitation of Slacks Creek and an upgrade to public transport facilities. These proposals offer a framework for future planning scheme amendments made by Logan City Council. In Logan City Council's Local Government Infrastructure Plan (LGIP), plans for land acquisition of two local state schools for new parks and town square is estimated to occur between 2019 and 2021. Springwood Summit was held in October 2016 to jumpstart further public interest and discussion of the suburb. The summit had the tagline: "The start of SEQ's next CBD". More than 200 delegates from around the world attended the summit. ^ Australian Bureau of Statistics (27 June 2017). "Springwood (Qld) (State Suburb)". 2016 Census QuickStats. Retrieved 18 March 2018. ^ a b c "Greater Springwood Masterplan" (PDF). GHD Group. 13 Oct 2009. Retrieved 23 Nov 2016. ^ "South East Queensland Regional Plan 2009-2031" (PDF). The State of Queensland (Queensland Department of Infrastructure and Planning). July 2009. Retrieved 12 November 2016. ^ "Local Government Infrastructure and Plan - Summary of extrinsic material for the parks component of the parks and land for community facilities network" (PDF). Logan City Council. 8 October 2015. Retrieved 23 Nov 2016. ^ Council, Logan City. "Planning Scheme Amendments & TLPI". www.logan.qld.gov.au. Retrieved 2016-11-23. ^ Council, Logan City. "Springwood Summit". www.logan.qld.gov.au. Retrieved 2016-11-23. ^ "South East Queensland's next CBD". Retrieved 2016-11-23.